As bibliophiles, I’m sure we all have different ways of organizing and keeping our beloved tomes—both on our physical shelves and on our virtual shelves. So let’s share a little bit of how we do it. 1. Describe your physical library/bookshelves. Are they randomly placed or do you have them organized in a special way? Are they confined to one area, or are they spread out over your house? With the exception of one bookcase in my living room and the above pictured “brag shelf” (also in the living room), all of my bookshelves are in my spare bedroom/office. Now, that doesn’t mean all of my books are in that room, but that’s where they’re supposed to live. 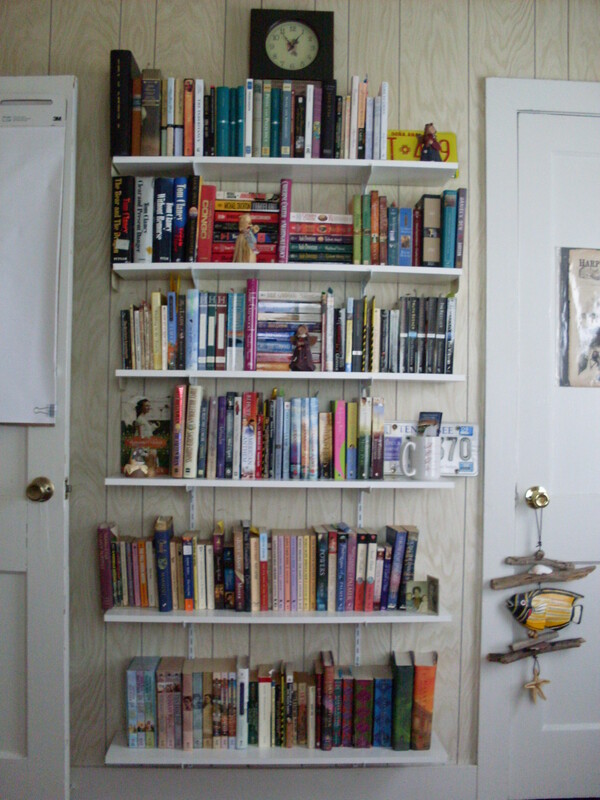 I have them sorted into fiction and non-fiction, with further categories in those: contemporary, historical, classics, YA, science-fiction, general fiction; writing books, biographies, old school textbooks, Bibles and Bible studies, Civil War, Jane Austen/Royal Navy/Napoleonic/Regency Era; etc. Within the fiction genres, they’re organized alphabetically by author. In non-fiction, they’re organized by size—tallest to the left, smallest to the right. When they’re all shelved, that is. Which isn’t very often. Right now, I have several new books (from the last few months) in the living room. I have several more in my bedroom. And there are more than I want to think about stacked on the table and the floor in my office waiting to be organized and shelved. Since I do most of my reading on my Kindle these days, I’m not bringing as many hard copy books into the house as I used to—which means that those which I am getting in hard copy are “treasure” books: books by friends and/or people I admire or books given to me as gifts. I need to go through and cull my collection and give books I’m never going to read (or never going to read again) to the library. That’ll be part of my spring cleaning plan this year. But there are some books I will never get rid of. Hmmm . . . at least twenty years. I know I have several Civil War books I bought when I was in college that I’ve never actually read (no, they weren’t for school, they were books I bought because I loved the era and was minoring in its history. I just never got around to them). Victora by Willo Davis Roberts. Even though I haven’t read it in two decades, it’s the book that drove me to start writing, so it’s one I’ll always treasure. 5. If you could pick one “lost in the stacks” book to re-read and share with other readers, which would it be? 5. What kind of e-reader do you have? What percentage of your reading do you use it for? I have a third-generation, 3G, keyboard Kindle. At this point, I do most of my reading (at least 99%) on it. 6. How many ebooks do you have, and how do you keep them organized? According to my “Manage Your Kindle” page on Amazon, I have 469 ebooks, most of which I downloaded for free (classics, special promotions), some of which are galleys (for endorsement consideration or of my own books), and some of which are library books which have long-since expired. And that number doesn’t include the few samples I have sitting on it right now. I have genre categories set up on my Kindle to make finding things easier. 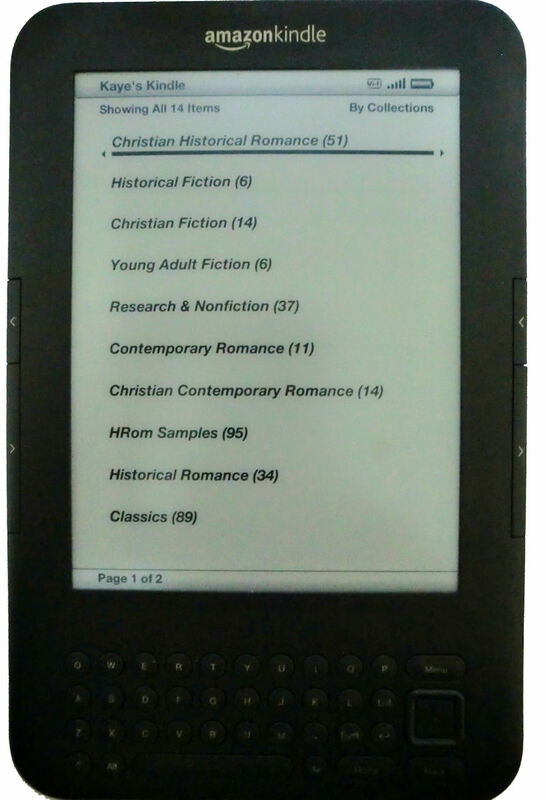 This is an old image of one of the screens on my Kindle—last year, I went through and archived everything but a few titles in each genre to hopefully help it run faster, which did help some. I also deleted all of the dozens and dozens of book samples I’d downloaded since I first got it in the spring of 2011. As I did, I looked each one up online and started a Books to Sample board on Pinterest. Which I actually like better than having the samples sitting on my device—I usually ended up going on the computer to look them up and see what they were about (and look at the cover) before deciding to read one anyway. So it’s just as easy to start off on that board and work from there. 1. I have some books on my headboard, they are my favorite books, your Ransome series included. I also have some books on the shelf under my tv, these are my most recently acquired books. 2. About 2 years ago I went through all of my books and gave away the ones that I knew I would never read again. That left me with a very small amount of books. 3. I really haven’t kept any books for that long. I held onto my Ted Dekker and Frank Peretti books for years, but decided to let someone else enjoy them. 4. MaryLu Tyndall’s THE FALCON AND THE SPARROW, it is one of her best books. 5. I have a Sony eReader. I use it about 20% of my reading time. I really want to get a Kindle Fire HD one day. 6. 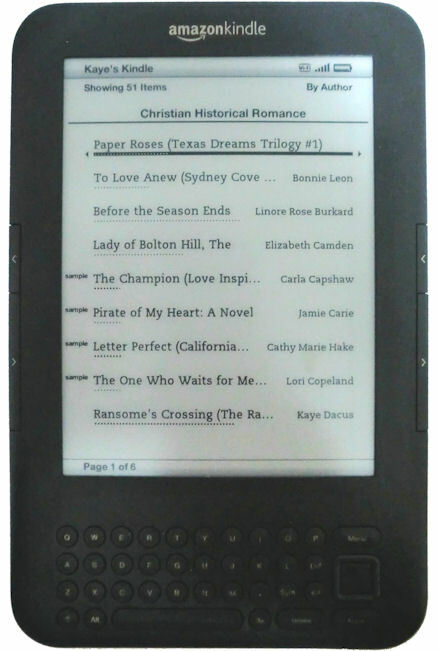 I have about 100 ebooks on my eReader and about 20 ebooks on my Kindle for PC. They aren’t organized in any special way. 1. 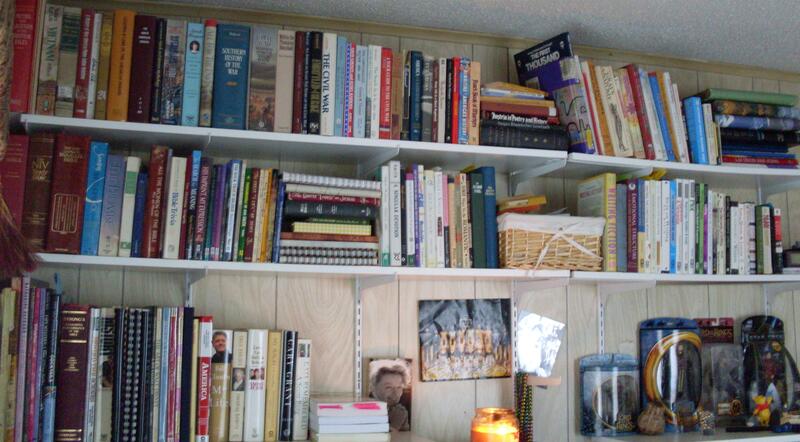 All of my books are in my bedroom on four bookshelves. 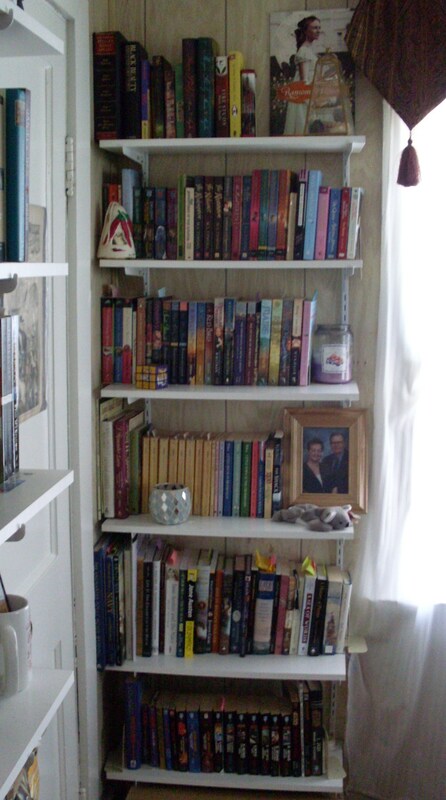 I used to have them sorted exactly as you do (except the alphabetical by author part) but I just recently switched and almost all of my fiction books are arranged alphabetically on 3 of my shelves and the fourth has my novella collections, Love Inspired, Children’s, Classics, and non-fiction! 2. I tend to hold on to my books unless I really didn’t like them! 3. Actually the oldest book unread book on my shelf is only about 8 months old. My goal of last year was to read all of the books I owned prior to 2012 and I was able to do it so all of the unread books on my shelves were added only last year. 4. Lori Wick’s The Californians Series. I have reread these many times and almost as soon as I finish them I want to read them again-they are awesome! 5. I recently won a Kindle Fire in a giveaway, but I haven’t gotten it yet and I have been using the Kindle app on my iPod Touch to read my e-books. About 12 percent of my books from last year were e-books. 6. I have 432 books for kindle and have gotten the majority free-I’m pretty sure I have spent less than $10 total! I don’t really organize them at all except awhile ago I started to sort between fiction and non-fiction but I haven’t kept up. My bookcases were built by my father. The first one he built when I was a baby, in 1951. It was the first thing he ever made. 85 years later, before he died in 2006, he ingraved his initials on both bookcases and gave them to me. The last one was not very well made as his health was declining, but I treasure them both. Everytime I get a book from one of the bookcases, I feel my father smiling. I have very little in the way of hard copies books, any more. They are also still stored away from my move. When on the shelves I have them shelved by author’s last name and alphabetized by title. However, if in a series, those are in numeric order. Most of my collection consists of classics. I have very little contemporary authors in my hard copy books. I also have, as I have stated many times, I am sure, a collection of “A Christmas Carol” books. These are books that I have collected over the years with new illustrations, new covers. I don’t read any of those. I had, until my e-reader, one copy, which I read and the rest were just my “stash” (quilter term). My e-reader has over 200 books, not sure the total, only because I have not downloaded all of the books from the previous Nook Tablet to the Nook HD. I think the total there is somewhere in the 400’s. A lot of the downloads were from Guttenberg. 1. 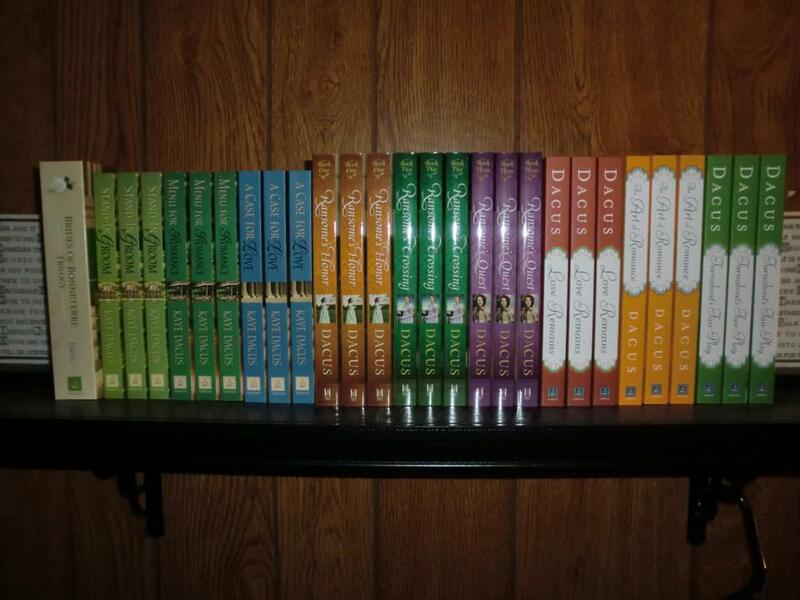 I have had my books organized just by author, but right now I have them separated between genres. Mainly because I don’t have anywhere near enough shelf space, so they are currently in big plastic boxes – one for modern day fiction, one for historical fiction and classics (that one is the fullest), one for sci-fi and comic books, one for fantasy, one for dictionaries, Bibles, devotional books, etc., and one for biographies and books on topics I love like Russia, airplanes, astronomy, and more. 2. I have always held on to all of my books, but actually just last week, I went through and took out any that I knew I’m never going to read or read again, and I ended up with a huge pile of classics and a pile of modern day fiction to give away. I must REALLY love historical, since there was only one I was willing to part with. 3. I don’t know an exact number, but I definitely have books that I still haven’t read after 5 years or more. A lot of those are the ones I am giving away now. 4. Hmm… Most treasured book? Maybe The Restitution by MaryLu Tyndall, because it was the first one of hers I’d ever read and really got me into the genre. Or Blink by Ted Dekker, which I’ve read 3 times so far… That’s a hard question, though. 1. Hubby’s books are [mostly] on the bookcase in our room. I have 4 bookcases in the basement/office/whathaveyou area. I have another waiting to be built ;). *One is non-inspy, Janette Oke, Gilbert Morris, a 15 books series and some 3 ring binders/misc – some of these are stacked sideways etc. The historical is overflowing at the moment. Hence the new bookcase ;). 2. I tend to keep most books but use others as giveaways, book exchanges or pass along. 3. Oldest unread? Years but not sure how long. Probably one of a series that I wasn’t crazy about by the end but got the last book anyway then never read. 5. Gosh – I dunno. But that series sounds interesting, Kaye! 6. I have a Kindle – I think the same one you do. 7. Um… over 1000 – mostly because I “bought” EVERYTHING free there for a while but have gotten pickier. A lot have been ‘removed from device’ or I put them in folders – To Be Read, WANT to read, Want to read again, Read, etc. My most ‘popular’ folder is “Influencer” which has all of my influencer/reviewer books in it until I read and review them then I move them elsewhere. I’m guessing about half my reading is on my ereader because of NetGalley’s ebooks for review. I almost always buy hard copies if its something I actually buy. [Unless it’s an ecopy only thing like Tyndale’s Digital First].